British folk rock musician and songwriter James Maddock first achieved success with his band Wood when multiple songs from their album Songs from Stamford Hill (2000) were featured on Dawson’s Creek. 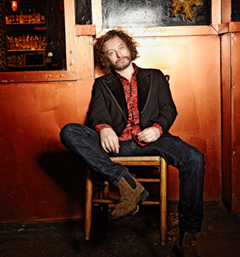 Since becoming a solo artist, Maddock has performed with Bruce Springsteen, released three solo albums, and become a resident artist at Rockwood Music Hall in New York City. A fixture on the New York music scene, his album Sunrise on Avenue C won the 2010/11 New York Music Award for Best Americana Album, and his fourth solo album "Another Life" was featured in American Songwriter Magazine and numerous blogs. Maddock wrapped up 2014 performing with Wille Nile and Garland Jeffreys on the Rock the Boat Cruise. Recently, Maddock finished his new solo album, The Green, and also co-wrote feature songs on the Waterboys new album. Maddock will be making international appearances throughout 2015 in Italy, the United Kingdom, Canada and Australia.